It is clear that quantified self-tracking, preventive medicine, and community-based research conducted by citizen scientists could be a huge new industry. The coming era of very large data sets and continuously collected information with algorithmic tools for signal-to-noise interpretation could significantly shift how the baseline measures of health are defined and managed. Citizen science is re-innovating the model for conducting science at every level. 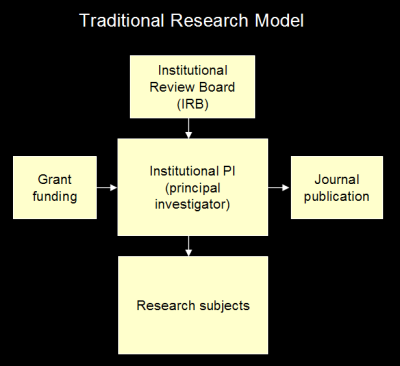 In the traditional research model (Figure 1), there is a principal investigator at an institution, conducting research on subjects, under the purview of an Institutional Review Board, supported by grant funding and publishing results in journals. 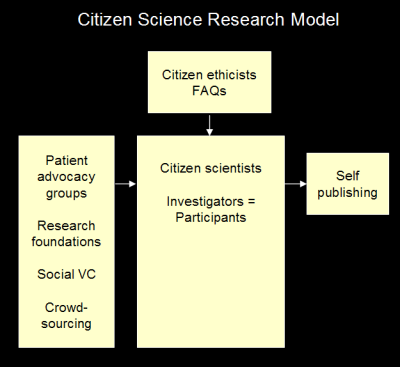 The citizen science model (Figure 2) is different as there is no distinction between investigator and subject, everyone is an investigator and participant; therefore the analog to the IRB is different, perhaps there are citizen ethicists, or a list of FAQs. Funding could come from patient advocacy groups, innovative research foundations, social venture capital, and crowd-sourcing; and research results could be self-published on the web. The farther future could include smartpatches - non-invasive, invisible, continuously-worn health self-monitoring skin patches. In the nearer future, a killer app for synthetic biology and other new chemistry and biology 2.0 methods could be the ability to create one's own vitamin supplements, and possibly innovate low-cost, non-prescription based finger-stick blood tests, and saliva and urine panels for self-testing. A significant barrier to the wide-scale adoption of citizen science in the context of health self-management, intervention exploration, and preventive medicine implementation is the high cost, inconvenience and discomfort involved in obtaining traditional lab tests. While many tests may be ordered in a direct-to-consumer fashion through DirectLabs, the Life Extension Foundation, and other websites, it still costs ~$100 per test. The challenge is to identify the requisite chemistry and processes involved and see if it may be possible to make simple consumer-friendly finger-stick blood test cartridges, similar to the glucose and HDL measurement kits sold at drug stores, which self-experimenters may perform at home or at community biolabs. Continuous monitoring via microneedle arrays would be useful for self-tracking glucose levels and other markers. For example, there could be consumer-targeted versions of the devices being developed by Orsense. Community labs and high-end home labs may include the (CLIA-waived) Cholestech LDX machine (~$2,000 for the machine + ~$5-10 per measurement cassette) which can assess eight different lipid profiles. There is an urgent opportunity to expand the range of finger-stick measurement tests. Below is a Wish List of basic tests for one-off or comprehensive panel delivery. "Life 101: Introducing Genghis Khan to the iPhone"
If is arguable that some large percent of dead persons would find enjoyment and utility in revivification. The interpretation of the core rights of the individual could be different in the future. “Life, liberty, and the pursuit of happiness” seems immutable, even when considered in the possible farther future context of many worlds, uploaded mindfiles, and human/AI hybrid intelligences. However, how these principles are applied in practice could seem strange from different historical viewpoints. Attributes that might be important to an individual now, for example embodiment or corporeality (being physically instantiated in a body), could well be moot in the future. On-demand instantiation could be a norm to complement digital mindfiles. It could be queried whether revived historical persons should have the option to re-die? Dying and suicide could be much different conceptually in a digital upload culture. Choosing not to run your mindfile could be legal, but deleting it (and all backups) could be the equivalent of suicide, which is generally illegal in contemporary society. An interesting question arose from discussions at the recent IFTF annual forecast presentation - Would people be more or less healthy in a possible future era of 3-D food-printing on-demand? Both sides of the case can be seen. The immediate conclusion might be that if anyone could print any food item on-demand any time, people would over-consume and be less healthy. However, one of the biggest mistakes that can occur when considering a potential future advance is thinking of it in isolation and not bringing forward all other aspects of technology and society to this point too. In an era with on-demand 3-D food printing, other changes are also likely to have occurred. The first and most obvious is that perhaps food content or accompanying supplements, drugs, and nutraceuticals have changed to mean that food that tastes good is not necessarily unhealthy, even when consumed in large quantities. Non-fat non-sugar substitutes may have become seamless matches in the quality of taste but not in caloric consumption. Today’s unhealthy foods could go the way of cigarettes. Automated calorie consumption data collection might finally be possible. A second argument for why people would be more rather than less healthy in an era of on-demand 3-D food printing is the massively granular physical tracking and biofeedback tools that could exist for each person. Smarthouse and smartclothing data collection through scanning and air, toilet, and unnoticeable blood stick diagnostics could be inputs to a continuously updating personal digital health model (e.g. ; the future analog to Entelos's virtual patient or Archimedes's virtual twin). A personal digital health model could be used to assess exactly which real-time nutritional adjustments are needed by an individual. An automated menu plan from the kitchen printer may be preferable for creating meals based on an individual’s known preferences and reactions together with real-time needs. The portable personal digital health model could be permissioned into restaurant settings to similarly allow for customized meal synthesis. 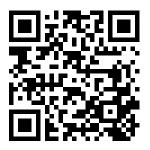 A third argument comes from considering the potential trajectories of social networking and behavior change research. Already peer social networks have a strong influence on individual behavior. One’s whole peer network or interest group could be encouraging healthy behavior via team-based support and/or competition. The advent and widespread adoption of self-tracking and social interaction tools could bring about a new sensibility and personal responsibility for health self-management. Optional financial incentives from insurance companies could further facilitate behavior change. In any possible future, there could be different technologies and social behavioral norms influencing the process of human nourishment. Food could become healthier over time and unobtrusive self-tracking tools and financial incentives could shift people to automated menu plans. Healthier behavior could be triggered just by making it easy.